Like What Dreams May Come, which inspired the upcoming movie starring Robin Williams, Somewhere in Time is the powerful story of a love that transcends time and space, written by one of the Grand Masters of modern fantasy. 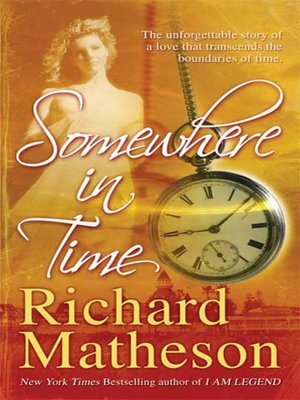 Matheson's classic novel tells the moving, romantic story of a modern man whose love for a woman he has never met draws him back in time to a luxury hotel in San Diego in 1896, where he finds his soul mate in the form of a celebrated actress of the previous century. Somewhere in Time won the World Fantasy Award for Best Novel, and the 1979 movie version, starring Christopher Reeve and Jane Seymour, remains a cult classic whose fans continue to hold yearly conventions to this day.